Cancer Biology: Scientists Cure Cancer? by a friend with a link saying, "Is this a legitimate solution?" I read the article and all I could think was "I want to blog about this!" The article describes a University of Alberta lab who are using the drug, dicholoracetate (DCA), to kill cancer cells. Dichloroacetic is an inhibitor of pyruvate dehydrogenase kinase, which activates pyruvate dehydrogenase. This promotes the use of oxidative phosphorylation in the mitochondria, over glycolysis. 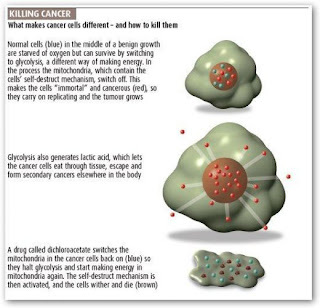 Reactivating the mitochondria also reactivates apoptosis, killing the cancer cells. So far, DCA has been tested in human lung, breast, and brain cancer cells. DCA killed the cancer cells and left the normal cells alone. In contrast to chemotherapy, DCA is selective for cancer cells and has seemingly no health effects. Studies have also been done in rats with several tumors. After drinking DCA spiked water, the rats' tumors shrank. Upon further reading, I found that DCA is in phase II of clinical trials for potential cancer treatment. The original paper was published in Cancer Cell. This provides more in depth information as to why inactivation of the mitochondria inactivates apoptosis and vice versa. The tumor shrinkage for the rats drinking DCA water is very well illustrated. But is this a legitimate solution? I'm skeptical, but eager to see once the clinical trial is finished. This does raise a few questions for me. Why aren't normal cells affected? Is DCA effective at reducing all tumors, not just the ones mentioned? Also, in rats, tumors shrank, but did not completely disappear. Does that mean after the DCA treatment the cancer could come back? Can it be used in advanced cancers that have metastasized throughout the body? In that case, the drug is not targeting one tumor mass, but cancer cells anywhere in the body. I am also surprised at how little information and publicity is out there about such a potential cancer cure. If this will revolutionize cancer treatment, why aren't we hearing about it?